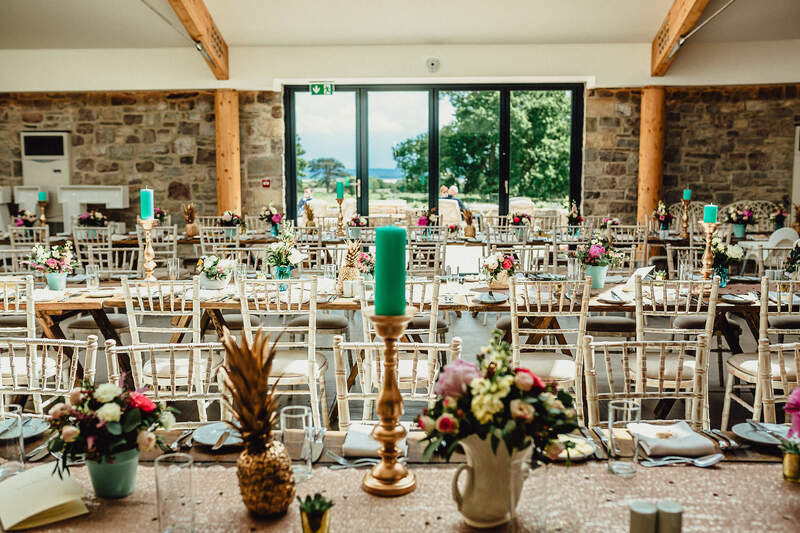 Whilst many couples are excited by the freedom offered at St Tewdrics, and the prospect of planning every detail of their wedding, other couples can find all the options and decision making overwhelming. It’s with this in mind that we’ve created our wedding package. The wedding package is available throughout the year, and is based on 75 day guests and additional 25 evening guests. Monday – Wednesday prices start at £8650 for peak season, and £8150 for other months. Thursday prices start at £10,150 for peak season, and £9,650 for other months. Friday and Sunday prices start at £11,650 for peak season, and £10,150 for other months. Saturday prices start at £12,150 for peak season, and £11,650 for other months. Additional day guests are charged at £75pp and additional evening guests are charged at £15pp. If you have fewer than 75 guests please contact us, and we’ll adapt your quote accordingly. The remaining bedrooms are charged at £150 per room per night. A live band and additional drinks are available at a supplement. If you’d like more details or have any further requirements, please contact us and we’ll be happy to discuss.